Born: March 1, 1952 in Kelowna, B.C. Dave Barr captured the 1985 PGA Championship of Canada at Brampton Golf Club in Brampton, Ont. That same year, Barr finished T2 at the U.S. Open and won the World Cup Team Championship with Dan Halldorson. Barr is a 12-time PGA Tour Canada winner as well as a two time PGA Tour winner, capturing the 1981 Quad Cities Open and the 1987 Georgia-Pacific Atlanta Golf Classic. He also became the first Canadian winner on the Champions Tour after taking the title at the 2003 Royal Caribbean Golf Classic. In 2007, Barr won his second PGA of Canada national title—the PGA Seniors’ Championship of Canada. 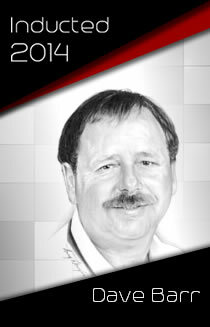 He was inducted into the Canadian Golf Hall of Fame in 2007.